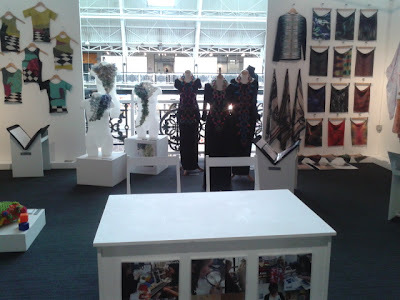 I displayed my Final Major Graduate Collection at the New Designers exhibition at The Business Design Centre in Islington, London. This was a great opportunity and an amazing experience I took part in, exhibiting alongside other Universities and graduates, specialising in various design areas in both fashion and textiles. This is my space on the stand (below) I used the same layout of my mannequins and jewellery as I did for the Graduate show because it was successful from the positive feedback I received from everyone. My collection was positioned in the centre of the stand which I was really happy about because it could be seen clearly from the front of our stand. This is our diverse stand showing a range of specialisms of print, knit and mixed media embroidery, I feel our stand was very diverse as it showcased a range of different skills and caught many peoples' eyes as they walked past, proving by the amount of professional interest each one of us had that week! Hello, I'm Rebecca Kaiser and I have recently completed my final year of BA (Hons) Applied Creative Design: Textiles at Hull School of Art and Design. I specialise in Knit and enjoy learning new techniques in both hand and machine knitting, creating accessories for both fashion and interior.